Vivekananda Kendra is propagating the message of Swami Vivekananda and Indian Culture since 1977 through its Yoga Shibirs in Vivekananda Kendra Nagdandi (Sri Ramakrishna Mahasamelan)- Kashmir. During Militancy period in Kashmir it discontinued (1990--2011).and Since last 3 years it was again started. 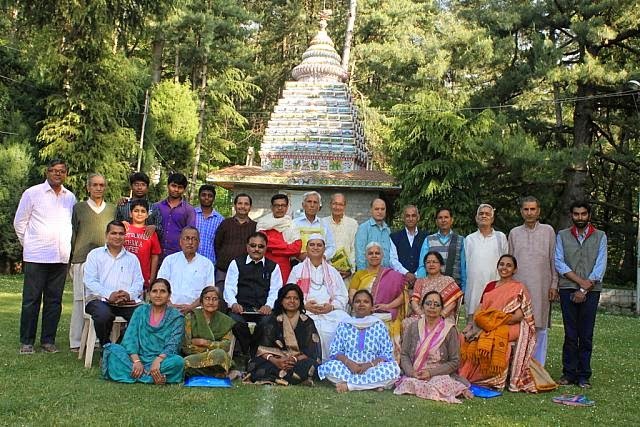 This year Yoga Shiksha Shibir (Hindi) of 10 days duration of All India Level from 21-30 May 2014 was organized in Vivekananda Kendra Nagdandi (Shri Ramakrishna Mahasamelan) Kashmir. Total 13 participants (4 sisters & 9 Brothers) from Andhra Pradesh, Himachal, J&K, Odisha, Harayana, Uttar Pradesh participated very enthusiastically. They followed the Yoga Way of Life as taught by Swami Vivekananda. The Participants ware distributed in Two groups, name of rivers: Vitasha (Jelam) and Chandrabhaga(Chinab). The Camp day started with Pratahsmaran at 6:00, followed by Gita Pathan, Yoga Abhyas, Breakfast, Shram Samskar, Lecture-1, Manthan, Lunch, Geet-Abhyas, Tea, Lecture-2, Yoga Abhyas/Meditation, Bhajans, Happy Assembly and Supper. In Yogabhyas Breathing exercises, Surya Namaskar, Asanas and Pranayama were practiced. During the Camp, lecture were held on: Concept and types of Yoga, Raja Yoga, Bhakti Yoga, Jnan Yoga, Bhagavad Gita, Swami Vivekananda, Eknathji Ranade, Story of Vivekananda Rock Memorial, Kendra Prarthana, Indian Culture, Challenges before Yoga way of life, Vivekananda Kendra movement and its activities. The Karma Yoga was explained through the selected Shlokas (Karmayoga Shlok Sangrah) from Bhagavadgita on Karma Yoga. The teaching of Yogic Kriyas, the Bhajan Sandhya, visit of important places in Kashmir Vally etc. was the part of the shibir. The deepening of the subject was done through the group discussions on the subjects. During Geet Abhyas, practice of Bhagavad Gita Chanting, Shlokas, Stotras, songs, bhajans was held. Omkar Dhyan was practiced. Devotional session– Bhajan Sandhya: with melodious music was a daily practice in the evening. Happy Assembly at night was the time for unwinding and sharing the talents by the participants in music, games etc. Many group games too were held then. Swami Kumarji of Geeta Satsang Ashram was present in concluding of the camp and gave his blessing to all on 30th may. The Camp was organized in a congenial atmosphere. Location: Nagdandi, Jammu and Kashmir, India.